Nancy Newsom, affectionately known as “the Ham Lady.” Staying true to family tradition and a family recipe going back centuries, her Kentucky aged hams have become world-renowned. Spain is a country that is world-renowned for their pork products. Everything from air-dried cured ham, to their mouth-watering Prosciutto, have delighted travelers for ages. One need not travel to the Iberian Peninsula however to enjoy such culinary masterpieces. The age-old and time-tested art of ham curing is alive and well, but can only be found if you get off the beaten path in Princeton, Kentucky. 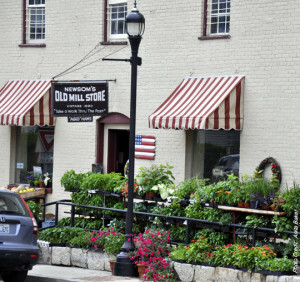 This tiny town, in the western part of the Blue Grass State, is most commonly known for a little country shop called Col. Bill Newsom’s Old Mill Store. It was originally called H.C. Newsom’s Store in 1917, the year Col. Newsom’s grandfather Hosea first opened its doors to the public. It was the typical country grocery store that carried everything from broomsticks and glassware to pickles… and of course crackers in barrels. At that time however aged hams were not part of their inventory because most people cured their own at home. With changing times and a faster pace of life the family custom of ham curing fell by the wayside. This was not the case with Hosea who clung to the tradition passed on to him by his ancestors, namely William Newsom, who first came to America from Newsham Hall, England in 1642. Col. Bill Newsom’s Old Mill Store in Princeton, Ky. where it all began. Hosea passed away in 1933 and left the store and the accumulated wisdom of ham curing to his son Bill Newsom. The young lad cultivated an interest in preserving this lost art. One can only imagine his enthusiasm when he fortuitously uncovered the seventeenth century ancestral will of William Newsom with the family recipe for ham curing. Bill Newsom, who later became a Kentucky Colonel, incorporated the wisdom of the past with what he had learned through his father by word of mouth. This invaluable knowledge was slowly imbibed by his daughter Nancy who would go on to take over the family business in 1987. The quality of product has earned her the moniker “The Ham Lady”, by The Wall Street Journal which has featured her in several articles. The secret to the mouth-watering ham produced by Newsom’s is a three step process and a certain innate sense that goes in to each one. It all begins with the hand rubbing of a salt and brown sugar mix deep into the meat. This old-fashioned method requires repeated rubs allowing this mixture to eventually seep through to the bone. There are absolutely no nitrates used however and this is one of main differences between a Newsom Ham and the mass-produced, store-bought versions. Besides killing unwanted bacteria, nitrates give ham that healthy, even if a bit artificial, red color. Newsom hams, on the contrary, acquire their deep, rich, wine color through a natural aging process while the salt kills any unhealthy organisms. 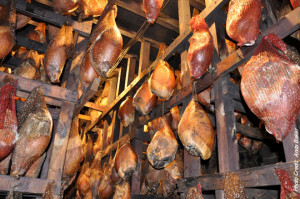 Newsom’s hams only begin to be slow or “cold smoked” in the smokehouse when the warmth of the spring sets in. Once the meat has absorbed these two ingredients each ham is hand washed and placed in the smokehouse, but only after the skin is just right: not too dry but, more importantly, not too moist. This is decided by “the touch” of “the Ham Lady.” This “touch” she explains was not something she was taught but is rather the decades long experience of working in a smokehouse since she was only a little girl. 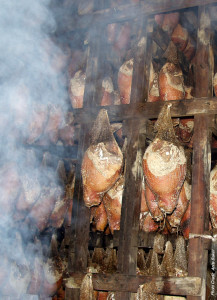 The hams only begin to be slow or “cold smoked” when the warmth of the spring sets in. That is when Mrs. Newsom starts a fire in an iron kettle, with a mixture of hickory wood and sawdust. Then comes the most important part of the ham curing process: the July sweats. The humid Kentucky summers produce an assortment of mold on the outer edge of the ham, giving the final product its own unique flavor, much like a good cheese. Smokehouses are different, Mrs. Newsom kindly explained and they have two. The older one, she affirms, has a better mold which gives the meat more personality. She knows this by a sense of taste equal to that of her sense of touch. Since Newsom’s do not use climate control—as do large producers—their hams are partially subjected to fluctuating weather conditions that only improve the final product. During particularly wet days the ham takes on moisture and expands into the outer mold-covered skin. During dryer periods it contracts and brings with it accumulated flavors. This process is similar to Kentucky Bourbon. The moonshine that originally goes into virgin white oak barrels takes on a marvelous amber color and wood tinged flavor through the expanding and extracting that takes place during the change of seasons. The Newsom’s understand, as do Bourbon producers, that excellence takes time. It is for this reason that Nancy, just as her ancestors before her, is not in a rush. They won’t sell a ham that is not aged for at least ten months whereas some will continue perfecting for twenty two. The Newsom’s understand that excellence takes time. It is for this reason that Nancy, just as her ancestors before her, is not in a rush. They won’t sell a ham that is not aged for at least ten months whereas some will continue perfecting for twenty two. One of her most prized endorsements came from Peter Kaminsky, cook, author and renowned barbeque chef. He is considered by some to be a specialist in all things pork which has earned him the nickname “hamthrologist.” He has tasted hams from all over the world, but the most glowing accolades in his book, Pig Perfect, are served up for Nancy Newsom. He gave further testimony to the quality of her product during a blindfolded taste test at a Fancy Food Show in New York City’s Jacob Javits Convention Center. This event was put on by David Arnold, founder of the Museum of Food and Drink. The purpose of the tasting was not so much to rank the ham, as it was to see if “American hams could stand up to their European cousins.” Mr. Kaminsky was given thirteen hams to sample and immediately picked Nancy’s as the undisputed best. Peter Kaminsky happened to be with “the Ham Lady” when she was given the greatest honor an American ham producer could ever dream of receiving. Newsom’s hams have received accolades from coast to coast, but one of its most prized honors is to be the only American ham in the Museo del Jamon, in Aracena, Spain. In May of 2009 Nancy Newsom was invited to participate in the 5th World Congress of Dry Cured Hams in Aracena, Spain. Just to be invited was an honor in itself when one considers how Spain is known for having the best hams in the world. “The Ham Lady” was utterly astounded when one of her two-year-old hams was given a place of honor in the Museo del Jamon in Aracena, Spain. It was the only ham in the United States of America to be “invited” much less kept for ham lovers across the world to admire. Through it all Nancy remains humble with all the attention and continues to relish the fact that she is preserving a “lost art.” She is also content to be just “the Ham Lady” from Princeton. 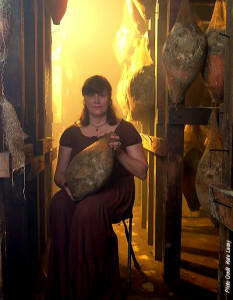 “As the daughter of a man who was quite ‘homespun’ himself,” she writes on her website, “I tend to hold to the methods of our forefathers, folklore and history itself.” She sees the yearly ham curing process as “a reenactment of a historic tradition” and is perfectly at ease with the limited number of hams she is able to produce. One particularly interesting composition, Gnarled Trees are the Best, reads like a self-portrait of the Newsom family. She describes such knotty specimens, which defy the test of time, as feats of nature. “No matter the storms and gales of life…,” she writes, “the old trees roots are deep,” and so it is with the remarkable history of Newsom hams. To find them one only needs to get off the beaten path… and look for the gnarled tree. Or you can call and speak personally to “the Ham Lady” from Princeton. 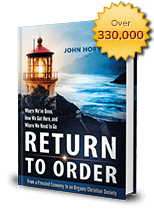 This entry was posted in Featured and tagged America, beautiful, Christian civilization, Family, Nobility of purpose, off the beaten path, organic Christian society, tradition by John Horvat II. Bookmark the permalink.